First Listen: Austra, 'Olympia' The Canadian band's second album showcases Katie Stelmanis' massive voice and increasingly personal lyrics in style, keeping one foot in the conservatory even as both are occupied on the dance floor. 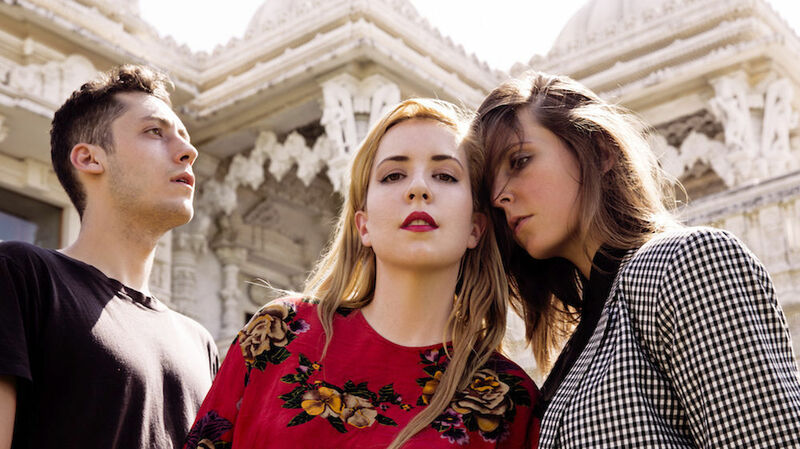 Austra's new album, Olympia, comes out June 18. Everything in Austra's music is painstakingly engineered to maximize drama, from its relentlessly pulsing arrangements — performed by a live band, no less — to Katie Stelmanis' sweepingly grandiose, Siouxsie-sized vocals. Stelmanis is a classically trained veteran of the Canadian Opera Company, so her soaring Gothic swoops are second nature by this point, but Austra's music still mixes the accessible hooks of electro-pop with the stubborn drive of house music. Over time, Austra has expanded from a core trio — with bandleader Stelmanis joined by percussionist Maya Postepski and bassist Dorian Wolf — to a sextet, and its sound has naturally become bigger and busier. In the process, that's meant letting some of the spare, arty mystery of 2011's Polaris Prize-nominated Feel It Break give way to the bombastic throb of Olympia, out June 18. But the new album still showcases Stelmanis' massive voice and increasingly personal lyrics in style, keeping one foot in the conservatory even as both are occupied on the dance floor.